I am indebted to Kate Guillemette and Linda Shafer who made this IEEE pilot project happen. 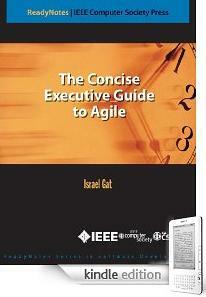 The IEEE Computer Society Press published today a ReadyNote that I authored entitled The Concise Executive Guide to Agile. It is available through the IEEE Computer Society Store. A Kindle version will be published in June. 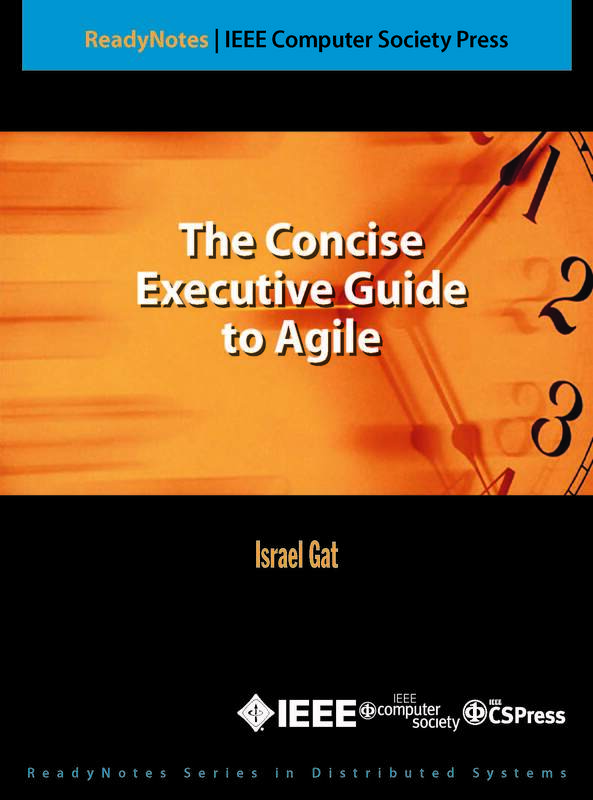 Provide the know-how for approaching Agile in a concise manner that requires minimal investment of time and effort by the reader. The ReadyNote does so by summarizing most Agile topics in a page or two. Detailed coverage of a topic is left for follow-on reading in the selected references that accompany each topic and in the Further Reading appendix. Be accessible to any executive — R&D, Marketing, Sales, Program Management, Professional Services, Customer Support, Finance, or IT. The only assumption I make is that the reader has a conceptual grasp of software and software engineering as well as an interest in learning about Agile. No deep knowledge, let alone technical knowledge, about software engineering is required for comprehending the guide. There is no fluff in the guide. Every paragraph has been written to satisfy the “And therefore what? !” criterion. It is my intent to drive a point home and make it clear to the reader what he/she could do with the information in as few words as possible. I would like to express my sincere thanks to Michael Cote, Michael Mah, Hubert Smits and to the fourth reviewer (whose identity I don’t know) for their many helpful insights and suggestions. I am also deeply indebted to Linda Shafer and Kate Guillemette of the IEEE Computer Society who got me to write the guide and supported the writing and editing process along the way. “ReadyNotes are short e-books that are tightly focused on specific topics” [IEEE Computer Society Press].